Last Saturday we met up with some of your friends from your old preschool, at our favorite place to dine out: Mellow Mushroom. We rarely eat out, so when we do, it’s always a special event; like when we moved into our new house… and for Valentine’s Day. It was a great place to catch up with your friends’ parents; meanwhile, you and your friends enjoyed hanging out underneath the table. Right after I had just paid the bill at the end of the meal, your friend Madison’s dad mentioned to me there was something going on behind me, near the front door. We scurried over to the scene. 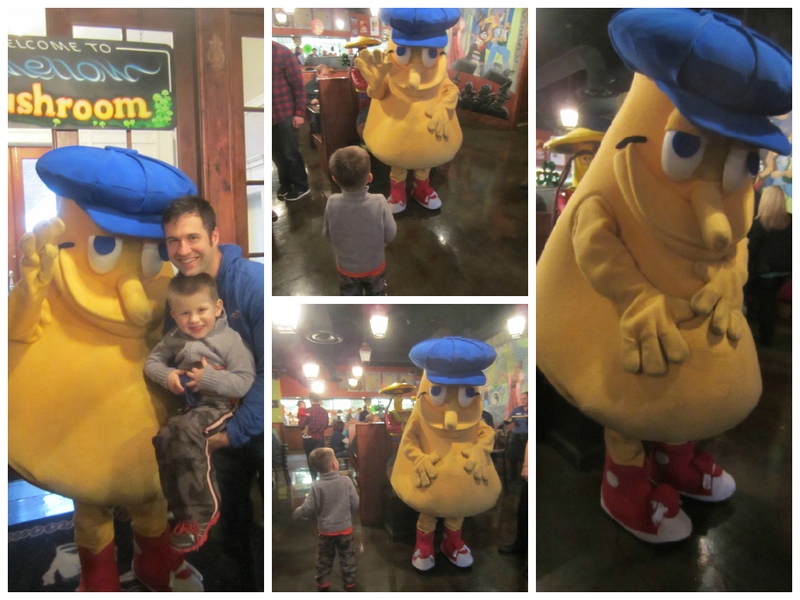 There was a staff worker dressed in the restaurant’s mascot costume; as Mel O. Mushroom. It was quite an intriguing spectacle… even for me to witness. You were obviously fascinated. I was somewhat surprised you showed no hint of fear whatsoever. The Mushroom Man gave you high fives; you gladly participated. You stood there in awe of his shroomy splendor. It’s not every day you happen upon a 6 foot tall mutant mushroom in the middle of downtown Franklin, Tennessee. I suppose he was there to participate in the St. Patrick’s Day Festival. You tried to look up his… mushroom skirt, for lack of a better term; to try to figure out whether it was a real person- or an actual, genuine mutant mushroom person. I explained that it was a person in a costume, which was what you thought; but I can still see you were having a little bit of trouble digesting that truth. After all, I too would want to believe the Mushroom Man was real.